Characteristics of Swiss Prehistoric Female Figurine. 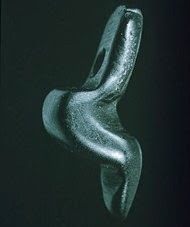 One of the last and smallest Venus Figurines to be carved during the era of Paleolithic art, the Venus of Monruz (also known as the "Venus of Neuchatel" or the "Venus of Neuchatel-Monruz") is a pendant made of black jet, in the shape of a stylized female body. It was discovered in 1991 at Monruz, in Switzerland. It is among the world's oldest items of jewellery art, and exemplifies prehistoric sculpture created during the final phase of Magdalenian art, which ended 10,000-8,000 BCE. The Monruz venus bears a strong resemblance to the Venus of Engen ("Frauenidol von Engen"), one of a dozen jet pendants excavated from the shelter of Petersfels (Baden-Wurtemberg), in Germany, except that the Engen figurine is dated to 13,000 BCE. Another jet figurine is the Venus of Pekarna, which dates to 12,500 BCE. The Magdalenian was the richest period of prehistoric art, notably in the craft of cave painting, although it also witnessed exceptional sculptures like the Venus of Eliseevichi. For the evolution and chronology of Stone Age art in Switzerland and the rest of central Europe, see: Prehistoric Art Timeline (from 2.5 million BCE). The Monruz pendant was discovered in July 1990, during construction of the A5 motorway at Monruz (La Coudre), in the commune of Neuchatel, Switzerland. It was found some 5 metres (16 feet) below the road surface, buried in the debris of a Magdalenian hunters camp (dating to 13,000 BCE), along with remains of flint tools, animal bones and hearths, sherds of ancient pottery and traces of red ochre. In addition to the venus, researchers also found three tiny earrings made of jet (lignite), although there were no traces of any cave art at the shelter. The Venus of Monruz is 16 mm in height, and carved out of jet, which is basically a hard variety of coal, but easily worked and polished. Designed to be worn around the neck, perhaps with its sister-earrings or a necklace made of animal teeth or perforated shells, the venus is extremely stylized, consisting only of the curves of a kneeling or seated woman. It is generally ascribed to the "Lalinde-Gonnersdorf" style of venus carving - sometimes called "femmes sans tete" (females with no heads). Its semi-abstract form is remarkably modern, being reminiscent of abstract sculpture by Constantin Brancusi (1876-1957) and Jean Arp (1886-1966). Different estimates exist as to when the Venus of Monruz was made, but it is safe to assume that it was carved no later than 10,000 BCE, during the last years of the Upper Paleolithic. Together, the venus pendant and the three earrings represent the oldest art in Switzerland. Famous examples of mobiliary art from the same approximate period include: the Swimming Reindeer (11,000 BCE), an exquisite ivory carving found in the cave of Montastruc, Tarn et Garonne, France; the "Ain Sakhri Lovers" (9,000 BCE), a semi-abstract stone sculpture found in the Ain Sakhri caves near Bethlehem; and the Shigir Idol (7,500 BCE, Yekaterinburg Museum), World's oldest known wood carving. The earliest art of this genre was made during the period of Aurignacian art (c.40,000-25,000), as exemplified by the Venus of Hohle Fels (38,000-33,000 BCE) (Swabian Jura, Germany), and the Venus of Galgenberg (c.30,000 BCE) (Austria) also known as the Stratzing Figurine. However, they proliferated throughout Europe during the following era of Gravettian art (c.25,000-20,000 BCE). Carved out of mammoth ivory, soft stone or even fired clay (Venus of Dolni Vestonice, 26,000 BCE), these female figurines were made in varying styles ranging from realist (Venus of Kostenky), through highly expressionistic (Venus of Moravany), to semi-abstract (Venus of Lespugue). Anthropologists are still unsure as to the purpose of these venuses, although the consensus among most prehistorians is that they were fertility symbols - not least because many of them are carved with exaggerated female characteristics including genitalia.  Venus of Monpazier (25,000 BCE) limonite figure found in Dordogne, France.  Venus of Willendorf (25,000 BCE) limestone statuette found in Austria.  Venus of Savignano (24,000 BCE) steatite figurine from near Modena, Italy.  Venus of Brassempouy (23,000 BCE) venus fragment (head) from France.  Venus of Gagarino (20,000 BCE) rock statuette from southern Russia.  Avdeevo Venuses (20,000 BCE) typical of the 'thin' Russian venus.  Mal'ta Venuses (20,000 BCE) another of the emaciated Russian figures.  For more about Stone Age sculpture in Switzerland, see: Homepage.